When climate scientists calculate Earth’s average temperature each year, they reduce a year’s worth of seasonal highs and lows for hundreds of millions of square kilometers of land and ocean into a single number. This big picture perspective is essential for understanding long-term climate change, but it largely smoothes away the “interesting” parts—the weather variability that has such a big influence on people’s daily lives. This series of maps of land surface temperature anomalies for Northern Hemisphere winter 2009-2010 is a case in point. 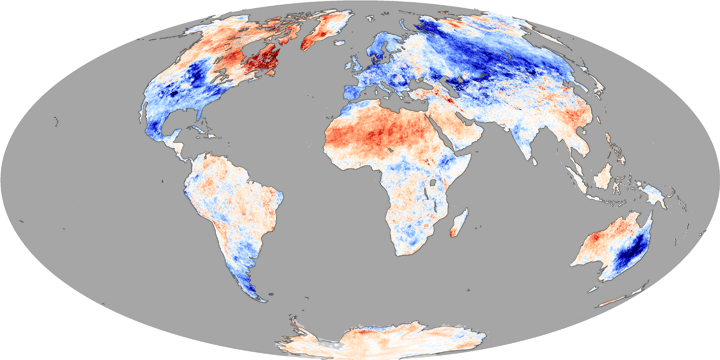 Based on observations from the Moderate Resolution Imaging Spectroradiometer (MODIS) on NASA’s Terra satellite, the maps show how temperatures in December 2009 and January and February 2010 compared to the 2000-2008 averages for each month. Places where temperatures were up to 12 degrees Celsius colder than the average are blue, places that were near average are white, and places that were up to 12 degrees warmer than the 2000–2008 average are red. 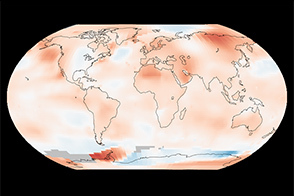 In late January 2010, NASA’s Goddard Institute for Space Studies announced that the 2009 average global temperature was among the hottest observed since 1880. Looking at these maps, though, you can imagine how surprising that conclusion might have been to many residents of Mexico, the United States, central Canada, Sweden, or northern Russia. Each of those places experienced strong, sometimes deadly, cold-temperature anomalies, and in some cases, record-breaking snow this past winter. Meanwhile, the land surface temperatures measured by MODIS in eastern Canada, Greenland, northern Africa, and the Middle East were much higher this winter than they were in other years this decade. In the higher latitudes, these patterns may be connected to the Arctic Oscillation. Land surface temperature is an estimate of how hot the surface within the satellite’s field of view would seem to the touch; it is not the same as the air temperatures recorded at weather stations. The surface the satellite sees might be barren desert, the top of a building, or the leaves of trees. 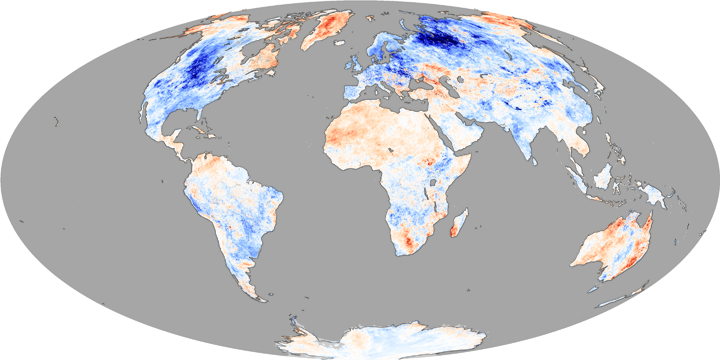 You can view monthly maps and animations of land surface temperature anomalies from the start of the Terra satellite mission in 2000 to the present in the Global Maps area of the Earth Observatory. Daily and weekly maps of land surface temperature anomalies (both day and night) are also available on the NEO Website. NASA images created by Jesse Allen, using data obtained from the using data provided by the Land Processes Distributed Active Archive Center (LPDAAC). Caption by Rebecca Lindsey. 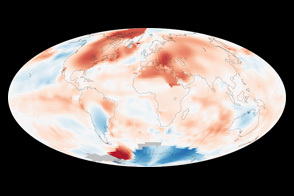 Northern Hemisphere winter 2009–2010 temperatures were unusually cold across much of the United States, Canada, and Europe compared to previous winters this decade, while Greenland, North Africa, and the Middle East were warmer than usual.